Size of this preview: 800 × 527 pixels. Other resolutions: 320 × 211 pixels | 3,032 × 1,998 pixels. 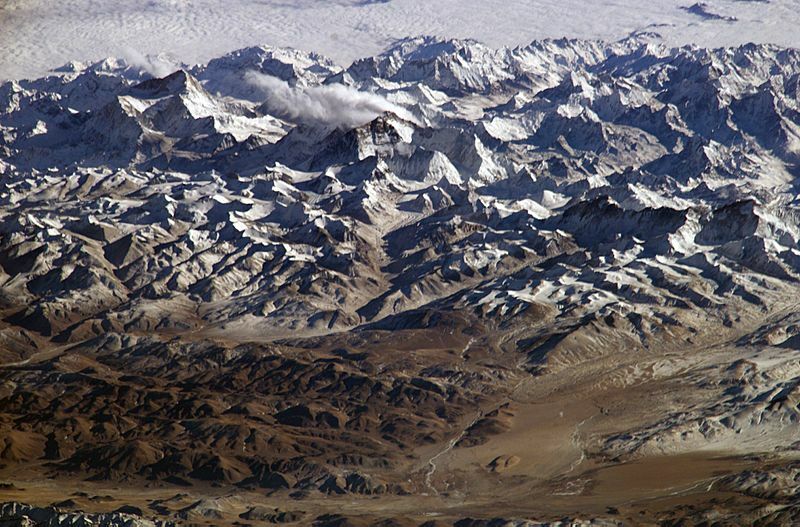 Description: Himalaya from the International Space Station. In addition to looking heavenward, NASA helps the world see the Earth in ways no one else can. 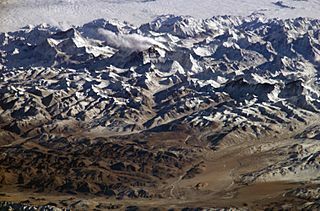 Astronauts on board the International Space Station recently took advantage of their unique vantage point to photograph the Himalayas, looking south from over the Tibetan Plateau. The perspective is illustrated by the summits of Makalu [left (8,462 metres; 27,765 feet)], Everest [middle (8,848 metres; 29,035 feet)] , Lhotse [middle (8,516 metres; 27,939 feet)] and Cho Oyu [right (8,201 metres; 26,906 feet)] -- at the heights typically flown by commercial aircraft. This page was last modified on 19 April 2017, at 22:33.